Harmar Mobility's AL400 Series combines a sleek, sophisticated design with the reliability and performance that you have come to expect from all Harmar lifts. Features include heavy-duty 400 pound lifting capacity, integrated offset post, stylistic covers and an extremely adjustable base with telescoping boom. 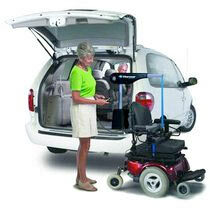 The AL400 series offers a high-quality mobility solution backed by Harmar's 3 year transferable warranty. Adjustable Boom Height: 30" - 40"
Adjustable Boom Length: 23.5" - 33.5"
The Harmar Mobility warranty is the simplest in the industry, a 3-Year Fully Transferable Warranty. If the product changes hands, the remainder of the warranty transfers to the new owner. Other manufacturers offer a warranty only on the original owner's usage, but we warranty the product itself. That is how committed Harmar is to producing the highest-quality lifts and ramps you can buy.